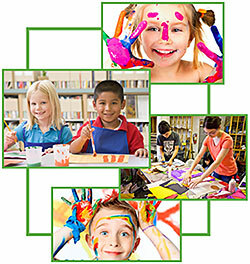 Art in the Town, offered in partnership with Brickton Art Center, gives children ages 8-14 the opportunity to experience an art education through qualified art instructors from the Brickton Art Center in Park Ridge. The children will paint, draw, sculpt, and explore different art mediums in an effort to enhance their artistic abilities. This program, now in its 14th year, is offered free of charge to qualified families based on income. To participate, the student must have a written recommendation from a school social worker or art teacher as to need, ability, and interest. We have only 20 spaces available for this program. Sessions are held at the Maine Township Town Hall on Mondays from 4:00-5:30 PM. The next group will run from January 28 – April 15, 2019. (There will be no meeting held on February 28 or March 25.) For more information please contact Anne at 847-297-2510 x272 or acamarano@mainetown.com.